United Nations General Assembly voted in favor of raising a flag of Palestine at its headquarters in New York, Sept. 10, 2015. The United Nations General Assembly on Thursday voted overwhelmingly to approve raising Palestinian flag at UN headquarters. 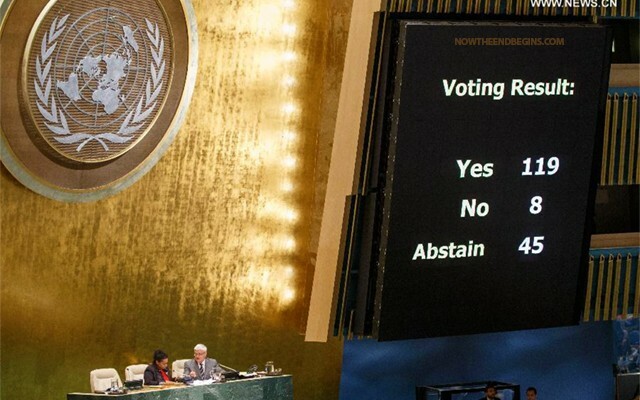 Let’s start with what is happening on September 30th, 2015: The world body of the United Nations General Assembly adopted the resolution on raising the flag of Palestine at the United Nations (document A/69/L.76) by a recorded vote of 119 in favour to 8 against (Australia, Canada, Israel, Marshall Islands, Federated States of Micronesia, Palau, Tuvalu, United States), with 45 abstentions. United Nations General Assembly voted in favor of raising a flag of Palestine at its headquarters in New York, Sept. 10, 2015. The flag of Palestine is set to fly over UN headquarters on September 30, 2015. Calling it “a historic vote”, the observer of the State of Palestine said that the General Assembly had sent an important message to the Palestinian people at a critical time. Raising the flag would signify to Palestinian people everywhere that the international community supported them. Israel’s representative called the resolution a photo opportunity, cautioning that as long as the Palestinians believed they could achieve their political goals without making concessions, they would continue to avoid taking the difficult decisions needed for peace. Instead, he said, the photo truly worth taking was one of an Israeli Prime Minister and a Palestinian leader raising the flags of the two peoples living together in peace. “in those days, and in that time, when I shall bring again the captivity of Judah and Jerusalem”: You can turn to the book of Joel in your King James Bible and in the margin next to these verses please write “FULFILLED” in the margin. This event took place on May 14, 1948, with the reestablishment of the nation of Israel back in their own land. “I will also gather all nations”: All this week we have been focused on the “gathering of all nations” at the UN, have we not? Do you think that God just places things like this in the Bible to sound poetic? No, it’s prophecy. A super-majority of all the recognized nations of the world “gathered” and voted to raise the flag of Palestine tomorrow. This part of the prophecy will reach it’s completion when they fully gather together with the Antichrist to make war against Israel in the Time of Jacob’s Trouble after the Rapture. “and parted my land”: That’s the “big one” right there, and one of the main reasons for God’s wrath. In Joel’s soon-to-be-completely-fulfilled prophecy, it says that this “gathering of nations” has “parted the land” of Israel. Why is that such a big deal? and all the coasts of Palestine? Israel is God’s Land, that’s why. “and all the coasts of Palestine?”: Palestine?!? What is Palestine doing in Joel’s prophecy of the last days in the 21st century? Because God saw that it would be there, side by side with Israel as their bitter enemy. Who are Tyre and Zidon? That would be Lebanon to the north of Israel. In 2015, modern-day Palestine is breathing down the neck of Israel, ready to strike with the backing and support of all the “gathered nations” of the world as found in the body of the group called The United Nations. Prophecy lovers and Bible believers, if that one fact alone doesn’t send a chill down your spine, then I don’t know what will. Tomorrow, I would ask you to pay close attention to the proceedings at the United Nations as they raise the flag of Palestine over the headquarters of the “gathering of nations”. For it is the beginning of the fulfillment of the prophecy of Joel, written thousands of years ago, yet more current than tomorrow’s events. It will reach it’s full conclusion at the Battle of Armageddon, but it is beginning now. We are so close to the Rapture that it’s almost like the two dispensations are over-lapping each other. In fact, we are transitioning from the Church Age which ends with the Rapture, to the Time of Jacob’s Trouble. We are living right now in the overlap between the two. We are living in the days of prophecy, the promised end times of the Bible. Go out and get something done for Jesus while there is still time. Listen, and look up into the Eastern sky, as “come up hither” is about to be spoken to a born again and Blood-washed Church.